Microsoft is back with the latest step towards the release of the next windows 8 Tablet. Microsoft is launching Window's new version to make Windows highly popular on tablets with a a lot of apps and Thinner, Lighter, Edgeless and Curved look to tablet.Windows 8 tablets and tablet built on Intel and AMD architecture . Windows 8 tablets will have the new lookup interface and dual-core Intel Atom processor, fingerprint reader, 2GB RAM and 128GB SSD and 11.6-inch display with a resolution of 1366 x 768 pixels. and kickstand and detachable keyboard. and low power consumption.with 5-a front-facing videoconferencing camera.Windows 8 tablets will be useful on business purposes also, the peoples who want to enjoy a slate for reading newspapers and magazines and work on Microsoft Word, Excel or PowerPoint will be benefited by this new tablet. 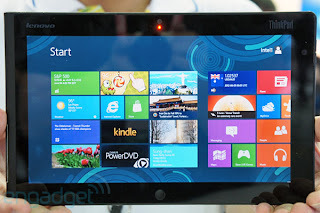 1-Windows 8 tablets will run on ARM, Intel and AMD chips . Windows 8 can run on AMD x86 -based hardware as same as the iPad or any Android tablet.and ARM devices will have Windows 8 pre-installed.Windows 8 tablets will deliver over nine hours of battery, 4G connectivity, NFC technology, weigh less than 680g and sport a slender, sub-9mm body. New ARM versions of Windows 8 tablets would have the traditional desktop as well as the new Metro interface through the third-party Metro apps. Microsoft is also facing some what of a backlash as Windows 8 loses the Start Orb, better known as the Start button - it's replaced by the Metro interface.Microsoft has had to defend the decisions it's made with the Start Menu in Windows 8.